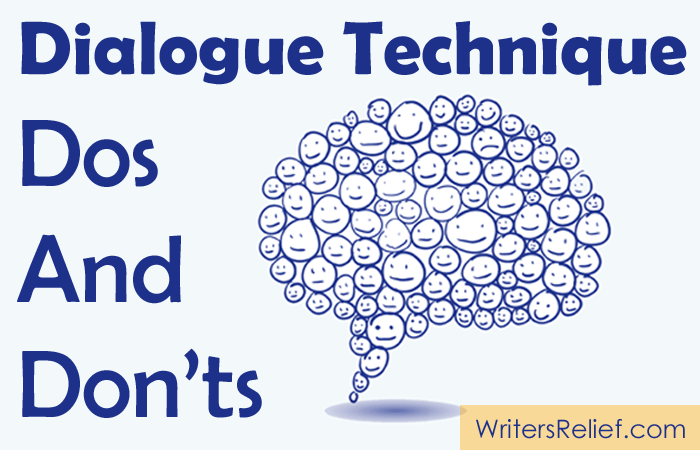 When writing dialogue for stories or novels, you would think it’d be easy to talk the talk. But writing strong dialogue between characters requires knowing how to use specific craft techniques effectively—and knowing which grammar mistakes to avoid! Mimic the cadences of natural speech, but only to a point. For example: If writers actually wrote, um, like people talked—you know, in real life—then readers would have to, like, stumble through dialogue because of all the annoying, gosh, pauses, and stuff that happen in lots of real-life conversations. Control the flow. Every time a character interrupts a conversation to explore a thought or make an observation, the pacing slows down. Sometimes that’s a good thing—just be careful you don’t lose the reader’s attention. Be sure to remove any unnecessary conversation interruptions. Keep speeches short. Unless your character has a really good reason for talking for a long time, and he or she is genuinely charismatic and compelling, resist the urge to write lines of dialogue longer than a few sentences. Give each speaker a subtly unique voice. Characters who are truly developed in the writers’ mind will often have their own subtle patterns of speech and diction. That doesn’t mean every character needs an excessively distinct style. It just means each character should be fully developed. If you need to get emotional, put the words in your character’s mouth. Readers love when characters make big confessions or give voice to their epiphanies. It helps us to inhabit the moment with them. Adverbs. If a line is truly evocative of the underlying emotion, then an adverb isn’t necessary. “Oh, how I hate my life,” she said gloomily. Any word but “said” as a dialogue tag. Along with using excessive adverbs, new writers also tend to use words other than “said” in their tags. “I hate my life,” she moaned. Or “I didn’t know you were coming,” he giggled. First, a person can’t “giggle” or “moan” a sentence. A giggle is one thing. A moan is another. Characters speak sentences; hence, “said.” You might occasionally get away with words like “whispered” or “cried.” But take care. Dialect. With some exceptions (David Mitchell’s Cloud Atlas, anyone?) heavy-handed dialect is passé. When imitating natural speech, make as few changes as possible to reflect your speaker’s diction. “Ah am go-eeng to zee cin-ee-mah” is far more irritating to read than “I am going to zee cinema”—but both versions get the inflection across. Cartoony language. If you’re writing a character who may come off as a stereotype, be careful not to choose words that resonate as trite, generic, or cliché. Not all surfers say “dude” after every sentence. Write well-developed characters. Repeatedly using character names. New writers often have their characters calling each other by name multiple times during a single conversation, even when they’re the only people in the room. Unless characters have a meaningful reason to use first names to grab attention—“Jack! Look out for the falling piano!”—avoid it. QUESTION: What have we missed? Leave your dialogue tips and pet peeves in our comments section! ← Celebrate Short Story Month! I just wrote a short story where I tried to have the entire thing presented only in conversation. Not easy. Could use more tips with dialogues and punctuating them to seem natural. dialogue is always hairy what with trying to make it sound natural, adding regional inflection, like the difference between London English and say Birmingham, or Texas and Yew York is sometimes hard. What makes it even harder is when you have a group meeting with many different people speaking, male, female, old, young, command authority, then add in the subject under discussion, and unless you add some sort of a tag line, or incorporate person’s name somewhere in the sentence it can get very confusing to keep everything straight. Of course, the simple answer is for the author to avoid getting into the situation in the first place, and keep all the dialog to no more than two people at a time (lol). I personally try to avoid tag line like the plague, but sometime it can’t be helped. I struggle with whether or not to spell speech out phonetically. In casual conversation we tend to use words such as “wanna” and “gonna” quite often event though we write using the proper words. Michael I use tags when there is more than two characters in the scene to avoid using “said” too much. E.g. ‘I better call her now.’ John picked up the phone and dialled Sally’s number. Many good suggestions here. I tend to follow the late, great Elmore Leonard’s example as much as possible. He only ever used “said” in dialogue; although I’ll sometimes slip in “whispered” and a few other descriptive dialogue words if I feel they are needed. I’ve been reading a couple of books lately that do not use quotes around dialogue, but it is unmistakably dialogue. Is this a new trend? What do you think of it? Thanks for these helpful points to keep in mind. I would like to see a segment on how to punctuate dialogue. Yes, dialogue can be tricky for sure, and using it as “naturally” as possible is the key. I’m still trying to come to terms with completely dropping the “said” part of dialogue, and writing in a way that it will be understood that whoever “said” something will not be confused with the other character(s). Writing like that implies that your readers are really reading intently and you have their full attention. Of course, it’s all a part of “style” as well. It’s always interesting to see how a writer uses their dialogue.